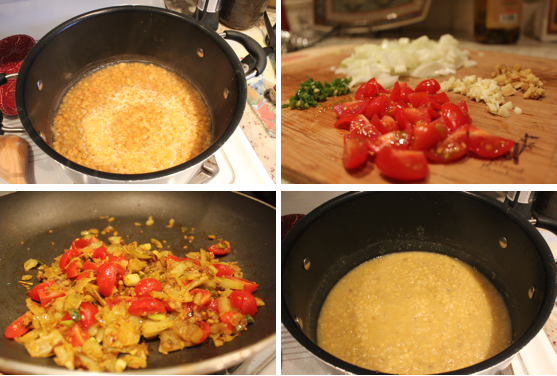 Last night I made Dhal. Dhal is an Indian dish made of stewed pulses such as lentils, beans or chick peas and seasoned with lots of spices and other good stuff. I combined a few recipes I saw online and cooked 1 cup of red lentils in 3.5 cups of water for about 45 minutes. When that was almost finished I sauteed up about 1 tsp each of mustard seeds, cumin, tumeric, ground coriander, and cinnamon with 1 onion, a few little green Thai chilies, a bit of garlic and ginger and maybe 5 or 6 cherry tomatoes. When the lentils had soaked up most of the loose water after about an hour, I gently folded in the tarka combination from my frying pan and voila: simple Indian comfort food is born. 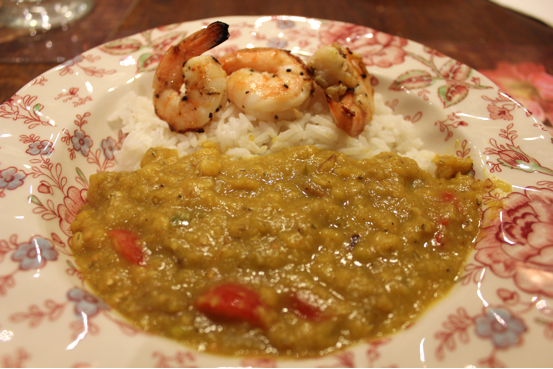 I matched my dhal with white rice and some grilled shrimp. My dhal had quite a bite to it which kind of masked some of the other flavors. I think next time I would sautee the tarka combination for a bit longer to release all of the flavors of the spices and goodies before combining with the lentils. Maybe I would also use one less chile. I'm glad to say that my first attempt came quite close to the taste and texture of my go-to canned Amy's dhal, so I was pleased overall.